There’s something seductive about a warm summer’s day, a gentle breeze, some quality garden time, your favourite garden hat and chair, a good book … and the sound of a busy bee. Accommodating bees and other pollinators in you container garden is easy because all you need to do is choose from a very wide array of edible and pretty plants, flowers, vegetables and herbs that will attract them – and there are just as many that suit containers within that list to choose from too. And guess what – since there are over 20 000 species of bees out there – there’ll be a bee or two that will find its way to your garden if you invite them in! The bottom line? Bees need sustenance and flowers need pollinators – a natural mutually beneficial swap. or anything that has ‘icide’ in its product name. “When you are sure, make it pure and when in doubt, leave it out” is a good maxim to keep in mind when it comes to chemicals in the garden. Keep your containers chemical free and this is possible, especially because containers only take up a small spaces so their regular care is easy. If you feed them, nurture them, keep them trimmed and weeded and cossetted – disease will seldom visit – your plants will be strong and anyway, because your approach is regular and hands-on, you will pick up on anything untoward and sort it out immediately not so? Use organic sprays if you must or home-made versions with garlic, chillies etc. Note that plant treatments that include Neonicotinoids are especially toxic to bees. If you are careful with the products you buy in general for your garden, then read the labels and note that the following ‘big words’ should be avoided at all costs – and you will find them in many of the commercial sprays available in the garden centres. Make a note of them in your gardening journal and do not use any product that contains them … they are all neonicotinoids. Imidacloprid; Acetamiprid; Dinotedfuran; Clothianidin; Thiacloprid and Thiamethoxam. You could never have too many flowers, the more you have across the seasons, the more attractive your pots will be for bees. They love flowers – all kinds, all colours, all shapes, and all fragrances – but like us all, they have their favourites. Purple is attractive (it’s the colour they can see most clearly) so plants like lavender, rosemary, catmint, alliums and buddleia are good choices. For nectar, tubular shapes like snapdragons, foxgloves, honeysuckle or penstemons will attract. Other flowers that will be useful are good for companion planting as well, or as natural pest control. Don’t forget herbs and include these amongst you choices whenever you can. 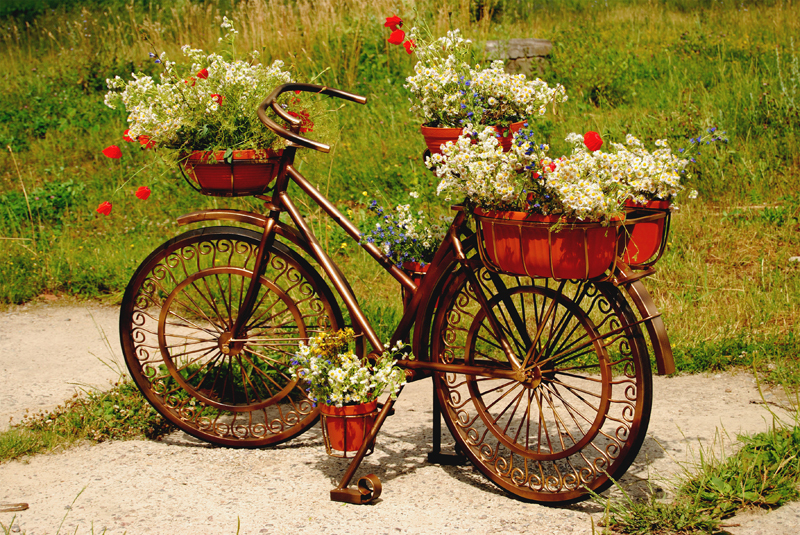 Go for Marigolds, sunflowers, buttercups, cilantro, fennel, sage, mint, thyme, hyacinths and roses. Bees also love fruit trees so go for a potted lemon or peach or apricot too. If you have the space, this is a way to simplify your garden, make it less fussy, easier to care for and more inviting to the pollinators and beneficial insects and all that will drop in for tea. If you don’t have space for more than one pot of something, no worries, just plant a nice big window box of colourful sweet pretties. The flowers you choose will provide the bees with the food they need, and there is such a wide choice of plant material that not only the bees will be satisfied. Consider too that the bees need to get to the nectar and the pollen readily – so simple single-petalled flowers are better than complicated doubles – an open-faced daisy will work, a double dahlia may not. Rather than saying ‘if you have the space…’ all the time, I will just say it once more then know that you will make a plan as you can. Buy a mixed meadow pack of seeds and grow them. Your pack will likely include a mix of annuals, biennials and perennials like sunflowers, coriander, California poppies,and bergamot. Once these are established in a wildflower mix, self-seeding plants will invite the bees back and back again, season after season … and you just need to keep them trimmed, watered and fed for your pleasure as well as theirs. **Grow some weeds – yes weeds! Many flowering plants labelled as weeds can be cultivated and are excellent sources of food for bees and other pollinators. Dandelions, clover, milkweed, goldenrod and others will turn your pot garden into a sanctuary for bees – so don’t always be too quick to pull them out, and if you have a path of lawn somewhere near, allow the dandelions to grow … you can eat them too, after your busy friends have had their ‘fill’ of pollen. Bees find water in all sorts of places that may slip past your attention. Newly watered plants in pots that have been mulched often offer captured drops, condensation of the early morning dew on brassica leaves, after rain, large leaves like hostas or elephants ears may have small pools in their centres, a dripping hose near your garden mint (left dripping on purpose, not by neglect), a quietly bubbling water feature, a shallow birdbath tray with stones for them to rest on … any source of ready water will be useful even if it is a ‘waterful’ purple side plate placed amongst the flowers. Providing a bee friendly habitat via your container garden is something anyone can do – and while focusing on this one aspect of your gardening design you will end up with a colourful, easy-care friendly surprise every time you go and sit somewhere near.